The Boston Herald's Mark Daniels also touches base on the Xander hype, talking to Steven Wright and Brandon Snyder about their initial impressions of the 20-year-old. John Tomase also speculates that the call to the majors may come any day for Bogaerts. Lost in all the attention paid to Bogaerts is his Pawtucket teammate Will Middlebrooks. Tomase talks about how the Red Sox still believe that Middlebrooks can be an impact player at the major league level. Speaking of promotions, right-hander Anthony Ranaudo (pictured) was called up to Pawtucket earlier this week and had a dazzling debut, tossing six shutout innings, allowing just four hits while striking out five in a win over the Buffalo Bisons (TOR) on Sunday. The Providence Journal's Brian MacPherson talks about another recently promoted hurler, left-hander Henry Owens. MacPherson talks about Owens' first start with Portland as well as the development of his curveball this season. MacPherson also checks in on Portland's Matt Barnes, discussing the right-handers development this season with pitching coach Bob Kipper. The Boston Globe's Craig Forde talks about Lowell right-hander Jamie Callahan's recent string of dominance. Ryan Rowland-Smith's interesting season in Pawtucket is chronicled by the Providence Journal's Brian MacPherson. Rowland-Smith was dominant before an appendectomy sidelined him. He had an opt-out date of August 5th, but has decided to stay with the organization, according to ESPN's Jerry Crasnick. 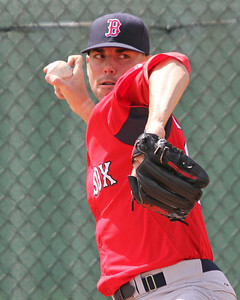 MassLive.com's Evan Drellich provides a few updates on injured Red Sox, including Alex Wilson and Franklin Morales. Dreelich also confirms that David Ross has been cleared to begin a rehab assignment tomorrow with Portland. In case you missed it, SoxProspects.com's Editor-in-Chief, Mike Andrews, recaps the month of July in the Red Sox system. The latest SoxProspects podcast discusses the Iglesias-Peavy trade, as well as the promotions of top pitching prospects. Tim Healey of WEEI.com and SoxProspects.com talks about Portland catcher Christian Vazquez's development and ponders what may lie ahead for the 22-year-old. Photo Credit: Xander Bogaerts and Anthony Ranaudo by Kelly O'Connor. John Gray and James Dunne are Staff Writers for SoxProspects.com.